Yes, you'll need a special engine wiring harness and a ECU. If you go efi, then don't buy the stock tank as you'll need one able to mount the in-tank pump and you'll need a return style fuel line setup. While wonderful to be able to reach in the window and turn the key and have the car start and run, it's NOT cheap nor easily accomplished. Many have done it, but if you're not either well versed in efi and/or fabricating/tuning then the sad old carb begins to show her virtues, eh? Oh, did I mention the 1000's of $ you'll also need before you're done? Your car, your call. Have fun! Thanks again guys for the info, and the opinions on EFI vs. carb. I need to give it some thought, and I'm definitely not in a rush to decide. I currently have a new concern that I'm not sure what to think of. I'm hoping that the junk yard where I bought the engine didn't misrepresent. They told me that it is a 360 out of a 2001 truck with 131,000 miles. Now that we have it cleaned up a little, I wanted to look close at the casting numbers and try to verify what I got. Everything that I read on-line says that it should be clearly cast on the drivers side of the block. Well, mine is not. Is there any "good" reason why the number might be ground off? I can see that it was made in Mexico, and there is a metal tag on the front of the block right below the head. The tag reads "22K7 708798". See pictures. There IS a cast number on the pass side behind the motor mount that reads "24097". I read that the cast number on the pass side is actually the production date? If so, does that mean that this is actually a '97 engine? I do have a 30 day warranty, so I guess we need to get inside, and see how it looks. I just don't understand the "lack of" casting numbers. Finally got the call from the machine shop that my engine is ready to pick up. When we tore it down, all the gaskets and internals seemed really clean for an old engine. And, as I mentioned earlier, the casting number is ground off the left side of the engine, and it was already bored .040. All that leads me to believe that the junk yard sold us a re-manufactured engine. We want to do the rebuild ourselves, so now we start down the "slippery slope of power" that 70chall440 spoke of earlier. And, as always, I would appreciate any input on power combinations. As of now, I am leaning toward shooting for the 400+ HP range, and I plan on putting in a manual transmission with OD. I also understand that I will have to upgrade my rear gear ratios. What I DON'T understand is how to choose a camshaft, and can I get away with re-using the pistons that came with it? When I get on Comp Cam's web site, I see soooo many options, and it's all Greek to me (lobe lift, duration, lobe seperation) My son picked one that he thought would be good. The specs on it are: .347/.353 lobe lift, 226/230 duration at .050, and 110 lobe seperation. Thoughts??? First off, congrats you are making progress. Second, yea you can reuse your old pistons so long as they are in good condition and provide the compression ratio you need to make the power you are after. 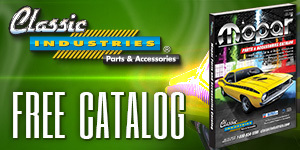 Next, you MUST look at the entire package to build reliable usable power levels; meaning in order to choose a cam you must have a plan that includes what intake you intend to use, what heads, what headers (size of primary tubes), compression ratio of the engine when built, type trans, potential gears, tire size, how you intend to use the vehicle (racing, cruising, etc). The cam is arguably the heart of the engine but is reliant on all of the other systems to maximize it's potential. Take a look at the stock specs for the cam (and engine in general), this will give you a base line. Next find the Direct Connection Race Bulletin for the A engine which will outline packages that factor in vehicle weight and provide specific parts. This will give you a better understanding of what parts work with what. There are literally thousands of combinations of possible parts if you factor in all of the various manufacturers and just as many opinions as to what works the best. Think of it like a detective trying to solve a case; start with what you know and then begin to fill in the unknowns. What I mean here is, you know what engine you have, you know what the bore and stroke are. You need to determine if you are going to use the heads or get something new. Once you have these 2 issues resolved, you can then call any cam company and tell them what you have and what you want (in terms of power level) and they will tell you what cam will achieve that. Do not focus on any one manufacturer, look at as many as you can stand to. Look for packages that include the cam, lifters, etc and see if you can find something that interests you. Point here is this, you can select X cam from Y company that is purported to deliver ZZZ HP, however if you do not have the heads (valves), exhaust and induction to compliment the cam you will not get what you are after. Additionally, if you do not have the right gears the power you will make will not deliver the driving experience you are wanting. If the gears are too tall (i.e. 2.76:1) it will run down the highway fine but not be pleasant to drive at lower speeds, consequently if the gears are too deep (i.e. 4.56:1) it will be a hoot up to about 45 mph when the engine is screaming. Since you are planning on running a manual with OD, you have a lot of "wiggle" room on the gears, meaning you can get away with running something like 3.55:1 or 3.91:1 and still be able to cruise at 70 without much issue as well as do smoky burnouts in your driveway. Induction is another thing you need to decide on; what intake and carb or EFI system. These need to match or compliment the cam, heads and exhaust. If you are thinking "man this is getting complicated" you would be correct, however it is not as bad as it seems especially with the internet as a resource. DO NOT make any snap decisions on anything engine related, rather look at it holistically as a complete system and on paper put it all together and then do the research to determine if it all will work together. Keep in mind that because X cam works for someone does not mean it will work for you. This is not as daunting as it seems, you just need to make some decisions up front so that you can put the picture together. Lastly, keep in mind that people have been slamming engines together for a very long time in everything from back yards to full up shops; it isn't rocket science but it can be done wrong obviously. A little research will go a very long way. I will add that when I built my stroker I scoured the internet for sources and ended up with Muscle Motors out of Detroit. The nice thing with stroker kits is that usually whomever developed them did so as a complete package. I was/am using an EFI 6 pack system, MSD and FAST ECU all of which I discussed with them. They told me that the package they recommended (pistons, crank, rods, cam, etc.) would deliver around 550 HP. I cannot say that this is what I got but I can say it is a monster. I am running 3.23:1 gears and a A833 4 peed and it will spin the tires in 3 gears. Point here is do not feel like you are alone and don't know where to turn; between the internet and the manufacturers there is a ton of information available. Thanks guys! As always, I appreciate the input. You are definitely correct about there being A TON of info out there on-line and thru soooooo many manufacturers. I spoke with one of them (Brian at IMM Engines). I like what I read about their heads, and he told me that he could help me with a cam selection that, combined with their CH318B heads, "should" produce 410 HP using my stock pistons and lifters (fewer components I have to buy). I've mentioned before that I bought my Challenger 30 years ago. I always wanted an old school mopar muscle car. Now that I can finally do something with it, I've decided to go old/new school with the 360 magnum. And I'm going with mechanical fuel pump, and carburetor (sorry 70Chall440). To do this, I understand that I will need a timing cover from an older 360. I am a little unclear on how old though. I work part time at O'Reilly Auto Parts. If I look up a timing cover and mech fuel pump, can you tell me what year range I would need to use to get the correct cover and pump? Thanks! Hey its your car, do as you like. Believe me I have owned a lot of carbs over the years, so long as you get them set up and don't let them sit you will be fine. Also, if you have ethanol free gas, it will make life a lot easier. As to the timing cover, I "think" that a 72-73 340 or even a 74 to 92 (pre Magnum) should work, but I admit I am not 100% sure. I went with a pre-magnum timing cover that has the mounting boss for a mechanical fuel pump. My latest issue is that the hump, on the timing cover, that has the timing marks must stick out a little further than the one that came off the magnum. Now, it looks like when we tighten the balancer, it will hit that hump on the cover? Two steps forward, one step back! Are harmonic balancers engine specific? I'm wondering if a balancer from an older engine would fit better. any suggestions? When it comes to balancers, its all about the balancing that the engine needs, internal or external. You need to research what your engine needs and look for a balancer that meets that requirement. You are the first one to go through this, I have to believe someone out there has either a timing cover that does what you need or advice on it. I would have to look, but you might be able to machine the hump off, if there is a hole then it would have to be TIG welded up. Worst case, call up someone like Hughes engines and ask them about this.